This past week saw my wife and I return to my parent's place in Aurora for Christmas. 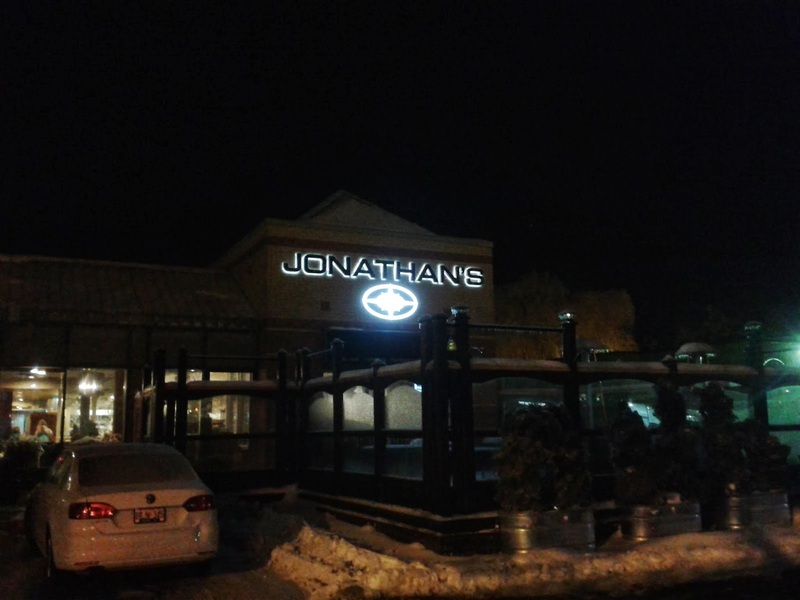 We requested one thing when we returned, could we get some quality Greek food at Jonathan's Restaurant (14845 Yonge Street, Aurora)? Sure thing! We arrived at 6 P.M. on Christmas Eve to find the restaurant pretty full and tables rearranged in preparation for the Christmas Day lunch for those who may need it in coordination with the local Salvation Army. We were seated promptly after arriving by our waitress as the hostess was assisting some other customers check out using the credit card machine. Jonathan's interior is a nicely decorated Mediterranean themed restaurant with hardwood tables and leather parson's chairs. The paint work, lighting and decorations seem to change on a yearly basis or to fit the time of season (e.g. Christmas, Easter, etc.).. The waitress who sat us returned after a short while of giving us our menus to take our order. The Order: 1 Pork Souvlaki Dinner with Rice and 1 Grilled Chicken club with fries. Our order was out in less than fifteen minutes. The usual Jonathan's service experience, food comes quick and still warm. The Pork Souvlaki dinner was a little different than when were at Jonathan's a little over a year ago. The salad now comes on a side dish served before the dinner as opposed to on the same plate. This was pretty good as the portion size seemed bigger than before. But this leaves the Pork Souvlaki skewers and the rice on the same plate as before looking a little less optically even though there was probably the same amount as before. This is really a toss up situation for the restaurant. Add more variety of options of when a customer consumes the salad by having a separate dish. Taste wise the Pork Souvlaki was the same as before, not overcooked yet tender. With a little tzatziki sauce added it is perfect for some Greek eating. The rice alongside is also slightly lemon flavoured and still moist. Perfect Greek souvlaki meal my wife was looking for. The Grilled Chicken club sandwich was a bit of change. Instead of being served on a kaiser bun, it had been changed to a pita. I'm not sure if this was a cost thing or if the chef had suggested changing things up to a pita. Nonetheless the Grilled Chicken club was how I remembered it. Fresh grilled chicken breast with lettuce and tomato sandwiched together with the pita this time with the side of Jonathan's fries. The fries were straight up regular fries Jonathan's has had for years. No changes there either. Not great over the top fries, but not terrible soggy either, just reliable standard fries. Overall, Jonathan's restaurant is a decent place for a dinner out. Good respectable service with knowledgeable wait staff accompanied by good wholesome food that the kitchen has mastered. Also, this restaurant loves to give back to the community. The next day, Christmas Day, they open for lunch to those less fortunate with referral from the Salvation Army. Locals also come to sing Christmas carols and entertain while the restaurant utilizes volunteers to serve the food and hand out donated items. A true hometown family run community oriented restaurant Aurora is proud of.